By default Architecture implies an intense commitment to being in the world. It has physical extension; it involves sequencing and it constitutes the autobiographical imprint in material substance of its creator. In brief, it resides in Time, Space, Existence. The Visual Poems project is a visual-textual artwork dealing with the broader philosophical choices architects make in their longing for meaningful space. Three are the existential premises journaling the uniquely personal itinerary of those individuals embracing architecture as a life project: the why (Epiphany), one’s place in the order of things (Avo/Advo-cation), and the challenged navigation of one’s own choices in life (Balance). Thirteen of these are pictorial poems illustrating an architectural design philosophy: Diversity, Organic, Place, Collaboration, Scale, Fluidity, Lyricism, Aspirational, Refine & Innovation, and Emotional Meaning, with a subset of Emotional Response, Function & Beauty, and Logic & Intuition. The poems reflect the inner world of design architect John Marx. The rebus is the rhetorical device both groupings share within the artwork. As an ensemble, they invite viewers to decode, interpret, connect, reflect. Each poem intersects the Visual (V), the Textual (T), and the Work (W), three areas encompassed in a living philosophy. We present our concepts through highly concentrated optical allusions. Our Work is impregnated with aspirations, ambitions, anticipations, that is those intentions mobilizing the individual to externalize in architecture all that lives within the self in an effort to communicate with others the range of emotions nested in the flow of Time. The articulation of that tension toward Space is just as diverse, representative of an inner poetic Existence the architect as artist protects and nurtures amidst adversities over a lifetime. What appears in this endeavor is a proposition, an entry point, dense with signification, where life is celebrated, honored, dignified, and memorialized. Architecture is a co-author of the book of Time, its setting being Space, framing the collective’s Existence. It transcends the immediate pragmatics of building to reach a dimension where the personal and the universal fuse into a socio-cultural and metaphysical continuum. Heretofore literary language has alluded to bigger things, the inscrutable, the ineffable, the ungraspable. Its unrepentant acknowledgement of the inner reality of the self- either producer or consumer of architecture- is an attempt to bring back the focus on a balanced relationship between the humane and the rational side coexisting in the mind. 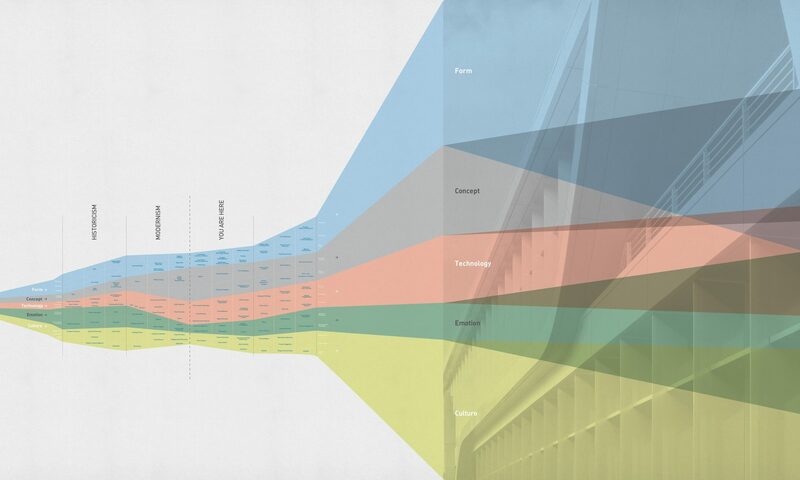 To connect with others now and across Time is at the forefront of architects’ hopes. The Visual Poem’s conversation aims at striking that chord resonating in those who feel the vastness of its argument. At its core, it is an attempt to reach out to those who love architecture as a higher pursuit and to add to its dialog. They shape the Work and in turn are recalibrated by it. Each designer would likely craft diverse conversations. Clustering these 10+3 (visual poems) 3 (existential premises) into an exhibition conveys the desire to engage the stable technology of paper. These visuals are reflections and solace, roadmaps and statements of belief, pledges and romance. Over three decades of John Marx’s design practice, the Work has unveiled a coherent philosophy, with conceptual invariants amenable for further development as the Work matures and the architect hones the art of design over decades. These Visual Poem commitments are both generative and interpretative of it. They unlock their coherent interconnectedness without remaining captive of the rational basis of design so defining of the architect as the problem solver alone. The labyrinthine thread weaving its way in the Visual Poems shapes our Work. Our projects’ iconicity is as purposeful as it is functional. Its contextualism is transformational, as opposed to mimetic. Unapologetically inserted in an urban and natural spectacle, they each activate an intent to experience what is seen in the beholder. In marrying the logistical to the post-physical, these Visual Poem commitments are equally generative of the works and interpretative of it. These Visual Poems are given purposefully enigmatic visual and textual representations. Such allegorical form woos the observer in a silent processing of these signs distributed on layered canvas engaging the symbols ruling one’s decisions and actions over a lifetime. The graphic texture of each composition is a springboard for the spectators to take a creative, interpretative leap, in order to make their own sense of that visual consumption, recursively rich in signification. Conceived as a stand-alone artwork, the Visual Poems introduce the onlooker to a puzzle with suggested connections. The narrative outlines one possible interpretation among many and explains the links in the iconography. Although the number 10 appears fixed as a numerical device encapsulating an array of concepts, that figure can be reduced or increased as needed to reorganize the fixed workpoints of other architects willing to articulate their time dependent story through this format. Nothing is either conclusive or definitive. The puzzle is open, holding pieces that are amenable to variable arrangements. Enjoy. John Marx, AIA, is the founding design principal of Form4 Architecture in San Francisco, CA. He advocates Philosophy, Art, and Poetry in the thoughtful making of place through the compelling power of form, aware that architecture is a balancing act between self-expression and collaboration. He has widely lectured on the topics of Design, Placemaking, and Cultural Vibrancy in Silicon Valley, in places as diverse as Korea, Italy, Austria, Australia, Canada and Isreal. He is the recipient of numerous international design competitions and over 65 awards.